We're thrilled that you found us and cannot wait to welcome you through our doors. Living Word International Church is a friendly international family based in Tulsa and our commitment is to make your life count. Through a dynamic ministry spanning over 10 years, preacher and teacher of the word, Blaise Tintong has helped many people develop passionate and purposeful relationships with God through His anointed Word. 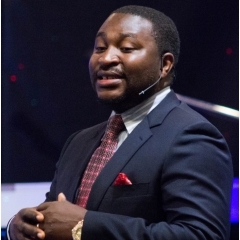 Blaise is the founder and president of both Fountain of Life Ministry International and Living Word International Church, where he currently serves as the Executive Pastor of the latter. Blaise holds a diploma in Pastoral Care from Kenneth E. Hagin’s school of ministry, Rhema Bible College, USA. He also holds both bachelor and MBA-Finance degrees from Oral Roberts University and is currently taking classes towards a doctorate degree in higher education administration. He has worked in various positions in the corporate world, including Human Resources and as a Financial Specialist of a multinational oil and gas service corporation. His love for people, faith in God, and the practicality with which he teaches the Word of God has encouraged many people to discover their purposes in life, live meaningfully for God, and passionately fulfill God’s plans for their lives. Pastor Blaise’s greatest desire is to see the lost come into the saving knowledge of Jesus Christ, the unreached reached with the gospel of the Kingdom of heaven, and to see God’s children living victoriously; thus expanding the borders of God’s kingdom here on earth. Pastor Blaise is married to a lovely woman, Esther, and God has blessed them with three sons: Blaze, Bryan, and Benjamin. He resides with his family in Tulsa, Oklahoma.